Researchers from the Development and Growth Control Laboratory at IRB Barcelona have identified the cell types and molecular mechanism responsible for the unlimited growth potential of epithelial tumours (carcinomas) and demonstrated that the growth of these tumours is independent of its microenvironment. "In epithelial tumours caused by chromosomal instability or loss of cell polarity, the interaction between two tumour cell populations drives malignant growth," explains Marco Milán, ICREA Research Professor and head of the laboratory. Published in the journal Proceedings of the National Academy of Sciences (PNAS) as a cover story of its 35 Issue, the study analyses solid tumours of epithelial origin in the fruit fly Drosophila melanogaster. "We have induced tumour development in two ways–by generating genomic instability and the loss of cell polarity. We have validated the causal relation between these two conditions–which are frequently observed in carcinomas–and the development of tumours," explains Mariana Muzzopappa, first author of the study and postdoctoral fellow in the Development and Growth Control Lab. Furthermore, they demonstrated that "the growth of epithelial tumours is dependent on activation of the JNK stress signalling pathway and that this pathway is intrinsically activated in the tumour, regardless of its microenvironment," highlights Marco Milán. 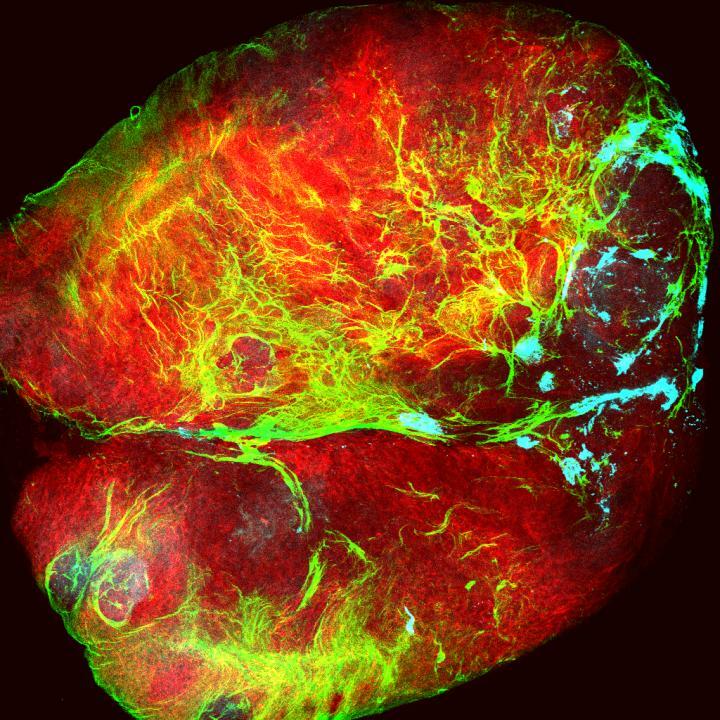 The researchers have identified two functionally distinct cell populations within the tumour–one that proliferates and ones that does not–upon which internal growth mechanisms depend. "JNK is activated in a group of non-proliferating cells, namely those that show the highest degree of chromosomal instability or that have lost polarity. JNK triggers the expression of growth factors and makes those cells still in the epithelium to go on proliferating. The continued proliferation of these cells leads to an increase in chromosomal instability and the loss of epithelial polarity in the tumours. Consequently, the number of cells expressing growth factors rises. These cross-feeding interactions explain the unlimited growth potential of these epithelial tumours," says Muzzopappa. The mechanism of JNK activation differs depending on the tumour. "We have observed that tumours derived from chromosomal instability are induced by oxidative stress caused by ROS (reactive oxygen species), which triggers JNK. The mechanism in tumours that arise from the loss of cell polarity differs," explains Marco Milán. This study was supported by the Ministry of Economy, Industry and Competitiveness (MINECO) through ERDFs "A way to build Europe" and "la Caixa" Foundation PhD programme, that supports Lada Murcia PhD student.